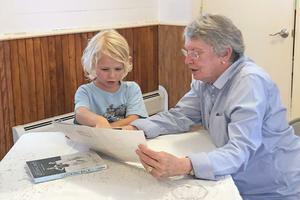 Five-year-old Nolan Decker explains the pages of a book he wrote and illustrated to fellow author Lois Lowry. 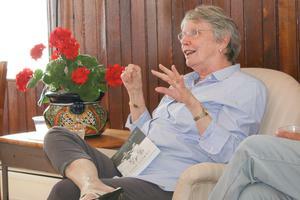 Critically acclaimed and popular children’s and young adult novelist Lois Lowry spoke in front of a standing-room-only audience July 27 at the Stonington Town Hall at an event sponsored by Stonington Public Library. Lowry has published 45 books since her debut novel A Summer to Die came out in 1977. Now 81 years old, she has amassed a career that spans across generations of fans. Those generations were all in attendance Friday night, as Lowry answered questions from library board members Jill Larrabee and Larry Estey, as well as from the public. The questions covered topics from specific books to Lowry’s life as a child and everything in between. There was only one question that was off limits for the author: What inspired you to write your books? “I never have a suitable answer for that question,” said Lowry. From the young age of 10, Lowry has been a published writer, though it took almost 30 years to get a “real novel” out into the world. Lowry has lived all over the world, which has served as inspiration for many of her novels. She was born in Honolulu, and has lived in New York, Japan, California, South Carolina and Massachusetts. The daughter of an Army dentist during World War II, the family finally settled in Portland, Maine. Lowry attended college at the University of Southern Maine, earning her degree in 1972. Lowry said she fell in love with Maine, including the town of Stonington, which she visited once prior to her most recent trip. Due to a marketing study, the main characters were aged from 12 in the book to 16 in the movie. Lowry also said she was disappointed that the relationship between the two main characters, which is nothing more than friendship in the book, becomes somewhat of a love story in the movie. Lowry went on to write three more books in the same realm as The Giver, and has also written other series including the Anastasia Krupnik series, and a spin off called All About Sam, which follows Anastasia’s younger brother. In a career currently in its fifth decade, Lowry is still hard at work. She has a new book in the works, based on the bombing of Pearl Harbor and the aftermath in Japan that followed. A graphic novel of The Giver is about to come out, and an animated movie version of her book The Willoughbys is in the process of being made, with a voice-over cast that includes Ricky Gervais, Martin Short and Maya Rudolph. “Those are just a few things I have going on,” she said. 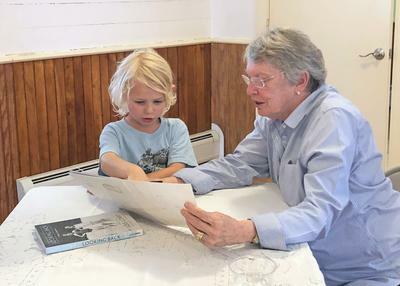 Author Lois Lowry describes characters from her critically acclaimed novels during a talk at the Stonington Town Hall on July 27. 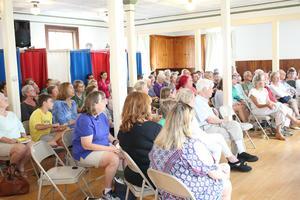 It is standing room only as people crowd into the Stonington Town Hall to listen to and meet author Lois Lowry on July 27.